Shortly after opening in 1992, Buffalo Billiards was recognized as a top ten billiard parlor in America by Billiard Digest. Owner Lee Simon brought his dream to life in his Cotati location that tried to present an up-stated elegance with a touch of history throughout. Move the clock forward to 2010 when Mr. Simon decided to relocate the venerable pool hall to a building that emitted as much history as the original pool hall tried to emulate. 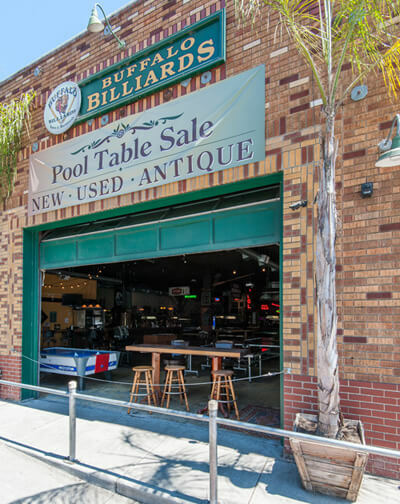 Buffalo Billiards is now located in Petaluma’s historic Theater District within the brick walls of the McNear Building along Petaluma Boulevard South. Lee added a very distinct touch to the décor of the building by repurposing former pool tables into useful elements within the pool hall. Anyone that sits for a cold craft brew at the bar will wonder how they got it to look so much like a classic Brunswick table, and they would be right to understand that the bar is made from several of the old tables. Creating the perfect atmosphere for a pool hall is something Lee Simon knows well. He also knows that working with the right marketing company will help to bring people to his unique establishment. He chose the Boylan Point Agency to provide the look and the performance for his outward reach to bring new customers to an amazing collection of pool tables, foosball games, shuffleboards, darts, and ping pong games. The Boylan Point opened its doors in October of 1997, within a month they were proud to call Buffalo Billiards a cornerstone client. More than 21 years later Buffalo Billiards continues to look to Boylan Point for their various marketing needs, including website design and management, Search Engine Optimization, along with the traditional media projects. From business consulting to graphic execution, the agency is responsible for keeping the pool hall and its associated sales showroom in the face of consumers and pool hall customers. No matter what Lee takes on, his projects are always crafted to cultivate the best experiences for his guests; from stunning details in the tables he restores to the custom Brunswick Monarch bar at Buffalo Billiards. Lee goes above and beyond to ensure that his patrons always have a great time and we are thrilled to have him as one of our many amazing clients! Part of our Client Corner series showcasing small business owners in the Bay Area.